“Klein Constantia didn’t know what to do with the grape skins that were left over from the production of their award winning wines. In the past they had fed the skins to their cows, but they decided to produce a limited edition grappa, as a gift to the people that were important to their business. 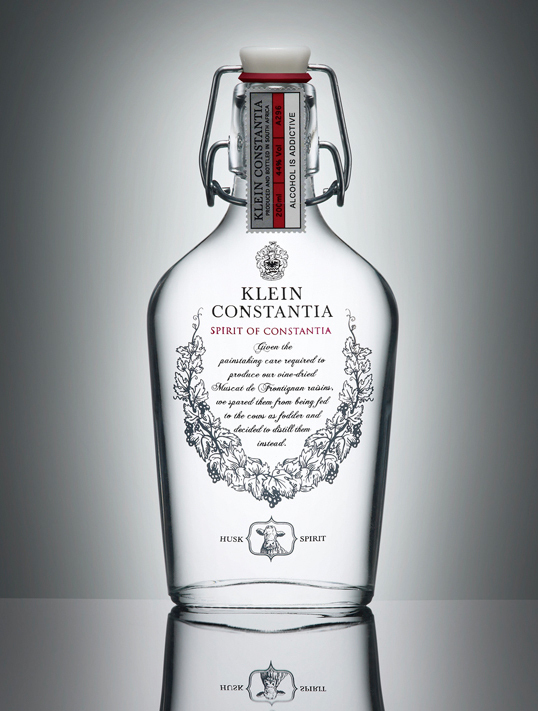 Because the Grappa wasn’t intended for sale, Klein Constantia proposed a “half-jack” bottle with a screw cap, but AT PACE was able to source 4000 beautiful bottles with a unique porcelain wire stopper. It wasn’t the type of bottle Grappa was usually sold in, since it wouldn’t have to compete with other products in the category, instead it felt unique and special. The design was simple and told the story of how the Grappa had come into being, but also made the product feel premium and important, more befitting of an artisanal gift. I like the neck and the top of the bottle.